This is the final post of a three-part series. See parts one and two. Have you ever noticed that our conversations about God’s existence leave out roughly a third or more of the world’s population? We frame our conversations as a choice between theism and atheism. This is really a Western foible. A large proportion of the world’s people believe in various forms of monism/pantheism and/or animism. But where do we see these worldviews addressed from a Christian perspective? Sometimes by missionaries and cross-cultural workers. Yet Western cultures are becoming increasingly permeated with these worldviews through travel, immigration and the worldwide web. In this series, I’ve tried to help things by explaining a third way that people think about God: (1)Christians think the universe begins with a Person (God); (2) atheists imagine everything as matter (there’s nothing but atoms and energy); but many in the East see ultimate reality as (3) some sort of impersonal consciousness (something like a super animal mind). Thinking about this third category can help us develop an apologetic that is better suited to our multicultural world. I have also noticed it can make Westerners more likely to listen when they find themselves in a less familiar three-way conversation. Once we’ve set out the options, we can can ask which one seems more likely. Here are some clues. First of all, we know that this universe does not have the resources to create itself. Its usable energy is running down and, if it is a closed system, it cannot recharge itself with usable energy. This would be against the observed laws of physics. What this means is there must be something powerful and infinite beyond this universe that started it up. If it were not powerful it could not inject the energy required to start this universe. At some level it must also be eternally self-sustaining or it would also be dependent on something higher. Second, we can ask the question which one of these looks most likely? Does the universe look like it came from natural processes as atheists argue? Or do its features fit better with what might be produced by an impersonal consciousness (like an animal’s mind)? Or does it bear the hallmarks of a personal creator? Let’s try to think it through. Animals have conscious minds that are directed by instinct. They use their minds to achieve the preset goals of those instincts; such as survival. If religions like Hinduism and Buddhism were correct; we would expect the universe to be structured to achieve preset goals like bliss and non-suffering in functional impersonal ways. We could expect to see evidence of planning, design and even information processing to achieve these preset goals. Human minds are directed by a personal self. We use our minds—not just to pursue instincts such as survival, wellbeing and pleasure—we also creatively choose our own goals and pursue them. Human minds, on the other hand, are directed by a personal self. We use our minds—not just to pursue instincts such as survival, wellbeing and pleasure—we also creatively choose our own goals and pursue them. Our chosen goals are personal in nature and they point to the interests of a person. We are concerned with things like our value and significance as a person. We choose things like meaning, morality, truth, beauty, love and creativity. We creatively plan, design and record and process information to achieve these goals. When we see evidence of these things we recognise the work of a person pursuing the interests of a person. These characteristics are beyond both matter and the instincts of an impersonal mind. They point to a higher level of direction. So when we look at our world, what do we see? We certainly see the laws of physics and chemistry at work. But is that all we see? When we look at life we see huge numbers of living organisms that look designed. They are packed with incredibly intricate biochemical machinery to enable them to perform a myriad of functions and to survive, adapt and flourish in varieties of environments. We see this at multiple levels, from the cellular level, the systems in multi-celled organisms and between organisms in complex ecosystems. Life is regulated by vast libraries of coded information in its DNA (or RNA). The nucleus of a human cell has around 3 billion base pairs of stored coding. This DNA also operates like a computer in processing and translating information to produce three dimensional, nano-sized machines and processing factories. At another level, this world looks cared for. Day and night and regular seasons allows for a regular cycle of work and rest; fertility, growth, harvest and rest. The sun provides warmth and light and rain provides water for growing crops and providing food. We also see extravagant beauty. As Stuart Burgess has pointed out, things look over-designed. Flowers and peacocks for example are far more beautiful than they need to be from a functional point of view. Stars and sunsets look magnificent on a grand scale to most people’s delight and awe. People in all cultures have a sense of morality. The details can vary to some extent from culture to culture. But no culture tolerates unbridled murder, lying, stealing and promiscuity. This sense of morality is inbuilt into people in the form of conscience. People demonstrate this in the way they condemn others as being morally bad for the things they do wrong. They are not just accused of breaking rules, there is associated moral condemnation for doing something morally offensive. People believe in the concept of truth. We rely every day on the world being rational, reliable and truthful to live. Our world looks as if it has been set up for us to see truth is a vital principle built into it. If it is in the nature of its Creator, it is something that can and should be pursued. This was the thinking behind the development of modern science by people like Sir Isaac Newton. Our experience of being human tells us how the personal self acts as a creative director of mind and body. But humans are also evidence of the work of a greater person. The personal self makes no sense if the ultimate is only matter or impersonal consciousness and belief in either of these leads to relegating the self (our most basic experience in life) to illusion. Atheists have great difficulty providing a satisfying account of why the universe exists like this. They have to imagine that such things happen randomly or that all these personal realities are really just tricks of evolution to help us breed and survive. 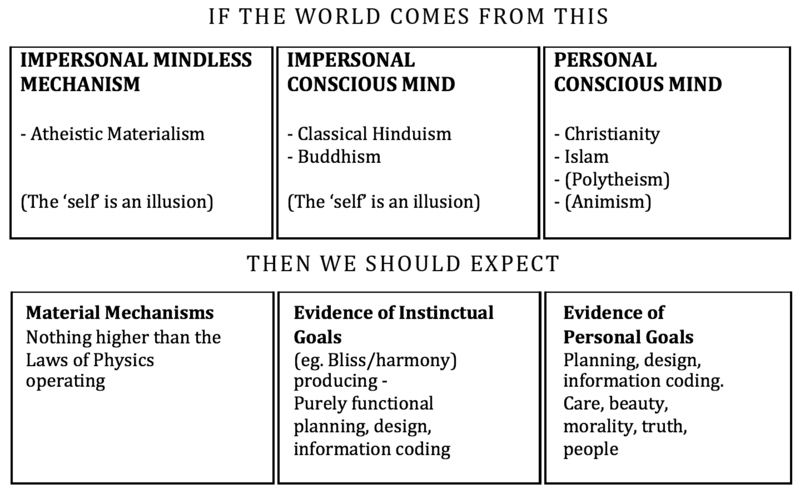 The same realities are also a puzzle for those who believe the world was created by an impersonal consciousness. One major problem for eastern worldviews is that ordinary life is viewed as illusion and deception—it is ignorance about the illusory nature of the universe that causes suffering and stops us reaching enlightenment. In fact, the construction of a universe with life is actually counterproductive to the instinct to produce bliss. Accordingly, eastern religions generally put down to mystery or a self-deception of the Infinite in a sort of dream. They see the universe is something to be got over or looked past. Imagine you came across an olive tree with a big stick next to it and lots of olives lying on the ground. You might think a person has been beating this tree to get the olives down but it could possibly have been a monkey doing it. However if the stick was shaped and polished and had carvings of olive trees on it so that it looked beautiful you would recognise the work of a person. The combination of function with elegance and beauty point beyond an impersonal mind to the work of a person in a way that bare function may not. Similarly, if we found a computer under a rock we might imagine that it formed through years of weathering or somehow a super-intelligent animal produced it, but our everyday experience tells us that only people make computers. Similarly, the more we discover about the universe, the more it looks like a work of majestic design, engineering and incredible artistry. Most of us can sense this just looking by at the stars—even without understanding any of the elegant laws of physics standing behind them. The design throughout the living world also fits with a great Creator. The immense library of information coded into in each cell points to a vast Intelligence. The stability of the world and its wealth of food-sources and materials fits with a caring Creator. Such extravagant beauty and over-design look as if Someone has been deliberately demonstrating their glory. This approach can help us in our conversations about God’s existence. Explaining the three possible sources of the universe is a useful starting point. We can ask a person to explain which of these they think is ultimate and then discuss relevant observations from General Revelation accordingly. For a Materialistic Atheist general evidence of an intelligent mind – personal or impersonal – can be confronting (eg. planning, design and information coding). A popular approach to showing God’s existence is to go straight to Jesus by going through a Gospel or even going directly to his resurrection. Having seen the nature of the other worldviews it gives us some clues as to what is important to emphasise. For atheistic materialists it is helpful to emphasise the truth of Jesus’ resurrection and his miraculous powers. These show there is something beyond their worldview that needs to be addressed. However for Hindus, Buddhists, Polytheists and Animists the existence of the supernatural does not confront their worldview. They also have stories of miracle workers and even resurrections—although these are still important in establishing someone’s spiritual power. For these worldviews it is important to keep emphasising the personal and perfect nature of the ultimate God and the importance of interpersonal relationships, both within the godhead and with us. Only then does God’s requirement for perfect justice, which can only be satisfied through the grace shown in Jesus’ death, start to make sense. We need to make clear that good works and dispelling ignorance cannot solve our problem with sin. John’s Gospel with its emphasis on relationships can be a good place to start. The gods of Polytheism/Animism as a source for our universe can also be addressed, if relevant, by pointing out that our world looks too ordered to come from multiple competing gods. Outside of the movies, we do not regularly see the laws of science being miraculously broken, as the stories of gods and spirits would suggest. Our world looks as if it has one Lawgiver, above all other gods and spirits, upholding an ordered universe. In Islam God is strictly one person, complete in his isolated self. Interpersonal relationships are not part of his intrinsic nature. (There is no Trinity.). Love/care, meaning, truth, morality and communication are of no ultimate value. So it could be asked why God would create humans, who find their greatest fulfillment in interpersonal relationships, when this is something so foreign to his nature and of no value to him? Don’t humans make more sense if there are interpersonal relationships within the godhead?